Eagerly awaited book by environmental lawyer and activist Polly Higgins is out now! POLLY HIGGINS is a barrister, international environmental lawyer and activist. In April 2010 she launched the campaign thisisecocide.com, which has already alerted thousands to the objective of establishing Ecocide as a crime. The Ecologist magazine voted her one of the ‘World’s Top 10 Visionary Thinkers’, and she has recently been nominated as ‘The Lawyer for Planet Earth’ in the 2010 Performance Awards. Eradicating Ecocide is published on 9th September to coincide with our London Book Launch this evening. Polly Higgins sets out to demonstrate how our planet is fast being destroyed by the activities of corporations and governments, facilitated by ‘compromise’ laws that offer insufficient deterrence. Polly offers a solution that is radical, but absolutely necessary: the recent Mexican Gulf oil spill is a compelling reminder of the consequences of un-checked ecocide. Higgins advocates the introduction of a new international law, Ecocide: ‘damage, destruction to or loss of ecosystems’, as the 5th Crime Against Peace. This would hold to account heads of corporate bodies that are found guilty of damaging the environment; it would present corporations with a new choice: they could choose to be part of the solution, part of the salvation of the planet’s future, by complying with the new law of Ecocide. The opportunity to implement this law represents a crossroads in the fate of humanity; we can accept the change, or we can continue to allow its destruction, risking future brutal war over disappearing natural resources. This is the first book to explain that we all have a commanding voice and the power to call upon all our governments to change the existing rules of the game. Higgins presents examples of laws in other countries which have succeeded in curtailing the power of governments, corporations and banks and made a quick and effective change, demonstrating that her proposal is not impossible. Eradicating Ecocide is a crash course on what laws work, what doesn’t and what else is needed to prevent the imminent disaster of global collapse. 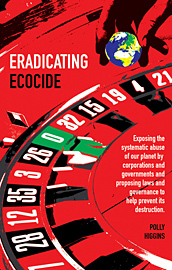 Eradicating Ecocide provides a comprehensive overview of what needs to be done in order to prevent ecocide. It is a book providing a template of a body of laws for all governments to implement, which applies equally to smaller communities and anyone who is involved in decision-making.